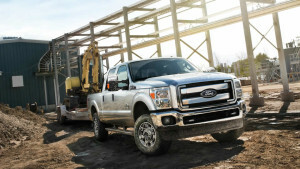 The Super Duty trucks offers a range of engines, like a 6.2L V8 Gas engine and a 6.7L Power Stroke V8 Turbo Diesel engine, giving drivers immense amounts of horsepower. For example, you’ll get 385 hp with the 6.2L V8 engine and 440 hp with the 6.7L Power Stroke Turbo Diesel. Not only that, but the Super Duty promises simply unrivaled amounts of towing capacity, ensuring drivers an unbelievable 19,000 pounds if it is equipped in the right way. At the same time, it also provides a maximum GVWR of 14,000 pounds. Finally, the Super Duty is outfitted with a huge number of powerful driver assist programs, including SelectShift, which gives you a 6-speed TorqShift automatic transmission with two-driver initiated modes. You’ll get a progressive range mode that limits the number of gears for overdrive, ensuring top performance on mountains and hills, and you will also get a full manual mode for even better control. Drivers from across Colorado can explore the 2016 Ford Super Duty’s performance features by stopping by our Glenwood Springs Ford dealership today in order to test drive this truck. Find us at 55 Storm King Road in Glenwood Springs, or give us a call at 970-945-2317. On the other hand, you can always fill out this easy-to-use online form. Don’t delay: experience rugged power in the Ford Super Duty today!